Four Unique Experiences Only Found in Adams County, Pa.
By Paige Neidig – Are you looking for something new to do during your next vacation to Gettysburg? 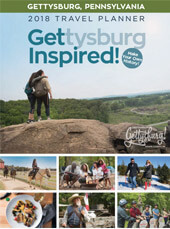 Mix things up with one of these unique experiences right here in the Gettysburg area. I bet you didn’t know Gettysburg is the home to 12,000 elephants, cat soldiers, a piano-playing pig and the world’s largest ball of ties! Both history buffs and cat lovers must check out Civil War Tails! Twin sisters Ruth and Rebecca Brown began making clay cat soldiers at 11 years old. Yes, the soldiers are actually miniature cats. They turned what started as a childhood hobby into one of Gettysburg’s most unique museums. The number of hand-made cats in the museum total nearly 6,000. And although the tails may not be true of Civil War soldiers, the dioramas have been created to match with accuracy what the actual battles would have looked like. Each cat represents one soldier present in battle. Your trip to Civil War Tails isn’t complete without purchasing a mini cat soldier of your own! Land of Little Horses Farm Park is just what it sounds like. It’s a performing animal theme park full of miniature horses and other farm animals. You’ll never see so many miniature horses in one place! Kids and adults alike can enjoy all that this attraction has to offer. Throughout each day, Land of Little Horses hosts animal races, parades, performances and shows. You’ll find a pig that plays the piano as well as a counting horse! With over 100 animals, you won’t want to leave. A miniature donkey, miniature horses and dogs roam at their leisure. Beware, their “puppy-dog” eyes will plead with you to give them hugs and treats. Your kids will have a blast riding miniature tractors and playing in the Wild West Park. You won’t forget a trip to Mister Ed’s Elephant Museum & Candy Emporium. Mister Ed began collecting elephants upon receiving one as a wedding gift. Since then, he has collected over 12,000 elephants. His collection doesn’t discriminate with elephants of all shapes, sizes and colors. They are all on display in his FREE museum in Orrtanna, Pa. – just 12 miles from Gettysburg. More than 100,000 people visit Mister Ed’s annually, not only for the elephants, but also for his homemade fudge, candy and roasted peanuts. Pack a picnic and take in the beautiful plant life, and of course elephants, in the gardens at Mister Ed’s Elephant Museum & Candy Emporium. Where can you find “Turtle Boy,” the world’s largest ball of ties and a vampire skull? The Gettysburg Dime Museum! The artifacts, both authentic and not-so-authentic, in this museum are endless. You’ll find the remains of animal anomalies and sideshow acts as well as life-size wax replicas of human curiosities and serial killer relics. Elephant man will greet you upon entering the museum. Newspaper clippings depicting the occurrences of mysterious happenings plaster the walls, even in the restrooms. You’re transported back into the times of circus sideshows and the unexplainable. But here’s a warning, if you too suffer from a fear of clowns, don’t step into the room of serial killer memorabilia. A life-size clown awaits you in the corner! Now that you know about these Gettysburg treasures, which are you going to check out? Do you know of any other unique experiences only found in Adams County?